The Heliosphere is often described as a kind of bubble that contains our solar system. This magnetic sphere, which extends beyond Pluto, is caused by the Sun’s solar winds. These winds spread out from the Sun at around 400 km/s until they hit what is known as interstellar space, which is also called local interstellar medium (LISM) or interstellar gas. Interstellar space is the space in galaxies that is unoccupied by either stars or planets. When the solar winds hit local interstellar medium, a kind of bubble forms that prevents certain material from getting in. Thus, the heliosphere acts as a kind of shield that protects our solar system from cosmic rays, which are dangerous interstellar particles. 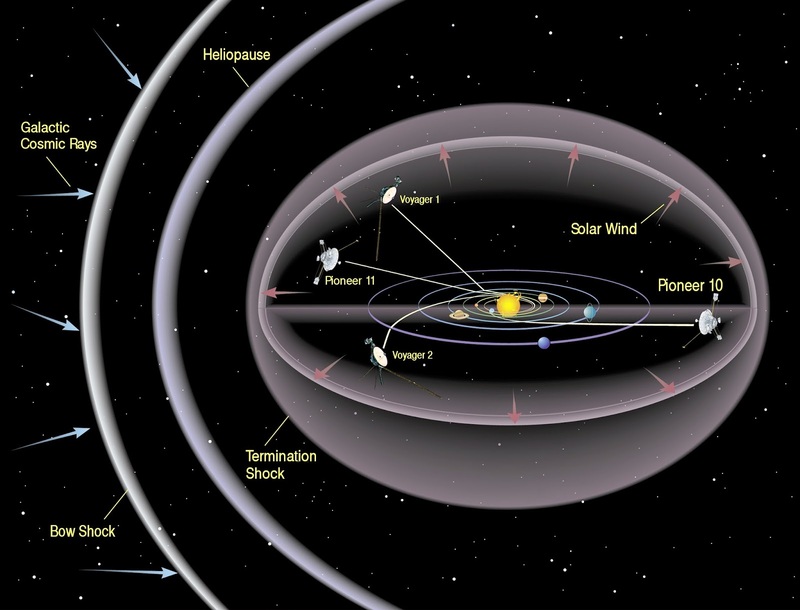 The Voyager Spacecraft have actively explored the outer reaches of the heliosphere, passing through the shock and entering the heliosheath, a transitional region which is in turn bounded by the outermost edge of the heliosphere, called the heliopause. The heliopause is what separates the heliosphere and the interstellar gas outside the solar system. This is where the final frontier begins. This is indeed exciting stuff! I love that the Voyager spacecraft are entering the final frontier. Voyager is certainly making a very long trip. Steve, you make science so simple to understand. That IS exciting stuff. So much to learn, so little time. That one is new for me and certainly exciting to learn. Wow, didn't know any of this! Stephen, you have far surpassed my knowledge about all things out of this planet earth. Wonderful theme with so much shared each day! I love to throw out these terms. I get such strange looks. So, to go any further we have to design space craft which can withstand cosmic rays. But - does that preclude life existing outside the heliosphere? Or does it mean it will be an entirely different life form? So cool. Glad something is keeping those cosmic rays out. Don't some of them get through. Is that what heliopause means? very cool and interesting. My boss plans to go up in space via Richard Branson's project. Don't think he'll be going out beyond Pluto. That is interesting. How long have scientists known about the heliospheres? It wasn't something I learned about in high school science, but then again, astronomy wasn't offered. Oh, to explore the final frontier. Wouldn't that be amazing! You're teaching us a lot about some very interesting things, Stephen. I for one am really enjoying this journey. Stopping by from the A to Z Challenge - great series and appropriate with the new Cosmos series on. I will sleep better tonight knowing the Heliosphere is on guard. Hi Stephen .. I don't think I'd realised this before - how interesting that there's a shield protecting the sun and its world, us included.